Refurbished to an extremely high level to include air conditioning, under-floor heating and a heated pool, this traditional Madeira house is set in an elevated position with panoramic views of Funchal and ocean. Being located on the road to Monte, which is only a couple of kilometres away, you can watch the famous Madeira wickerwork toboggans going down the hill nearby! Conveniently all on one level, the contemporary open-plan lounge, dining and kitchen lead via a naturally lit corridor to the three bedrooms, all of which feature air conditioning and under-floor heating, cable TV and benefit from the views to the ocean. The master bedroom has an en suite shower-room and the other bedrooms share the family shower-room. The whole frontage is the south facing solarium where you will find the heated infinity pool and sun-beds and the covered built-in barbecue and outdoor dining table, which overlook the wide garden below. Fully equipped kitchen. 4-ring induction electric cooker, built-in electric oven and microwave, fridge/freezer, dishwasher, coffee machine, kettle, toaster, hand held liquidizer. Sitting area, seating for 6, with flat screen cable TV, DVD, Bluetooth speaker. Air conditioning and heating, picture windows opening to pool solarium. Covered barbecue area with built-in barbecue, single gas ring, sink and worktop. Outdoor dining table for 6. Surrounding solarium with panoramic sea-view and sun beds. Covered area with a retractable sunshade. Heating is optional and costs, 120€ per week for 24ºC, paid in cash on arrival. Laundry with washing machine and clothes dryer, iron and ironing board. To secure your reservation, a deposit of 30% is required, or the full amount if within 8 weeks or arrival, and the balance is due 8 weeks prior to arrival. Should you cancel up to 8 weeks prior to arrival only the deposit is non-refundable, and whitin this period the full amount. A security deposit of 200€ is required by credit card at check in. Please ensure you have a valid credit card with you. If you do not have a credit card then the deposit must be paid in cash at check in. We had a very relaxing and refreshing stay. The house is at a very high standard, it was spotlessly cleaned and decorated at a beautiful modern, understated interior design. It was wonderful to return from our various trips over the island to this place where we could enjoy the view of the endless ocean by day and the lights of Funchal by night. We felt very well looked after by the agency on arrival and when checking out. - There is a road of medium size going round the property with some traffic on it (a few metres below the level of the property) however we did not feel disturbed by it and the house itself is very well insulated, so during the night it was very quiet. - We also took advantage from the busstop right in front of the property and on two occasions walked uphill to Monte (quite steep, but not longer than 20 minutes), using the little road behind the house. In Monte one then can take the cable car down to Funchal. Some lovely comments, thank you very much. We are pleased that the house and location was to your liking. Thank you so much for you great comments. Very much appreciated and certainly useful for future guests. Thanks again! A fantastic place, living area was nice, kitchen had everything you needed, bedrooms were really comfy. Outside BBQ was great and swimming pool was lovely. Pub just down the road and used the local bus service which was easy and cheap. Thank you very much. A very positive review and very much appreciated! Wir hatten eine traumhafte Zeit auf Madeira. Die Wohnung liegt oberhalb von Funchal mit super tollem weiten Ausblick. Die Fotos zeigen das Objekt genauso schön wie es ist. Unterhalb des Pools ist noch eine Art kleiner Garten mit Kräutern, die man auch nutzen darf. Die Ausstattung ist top und die Einrichtung sehr geschmackvoll. Zwei große Bäder mit Regendusche und Kommoden. Wir sind herzlichen empfangen worden und haben uns sehr wohl gefühlt. Wir kommen auf jeden Fall wieder! 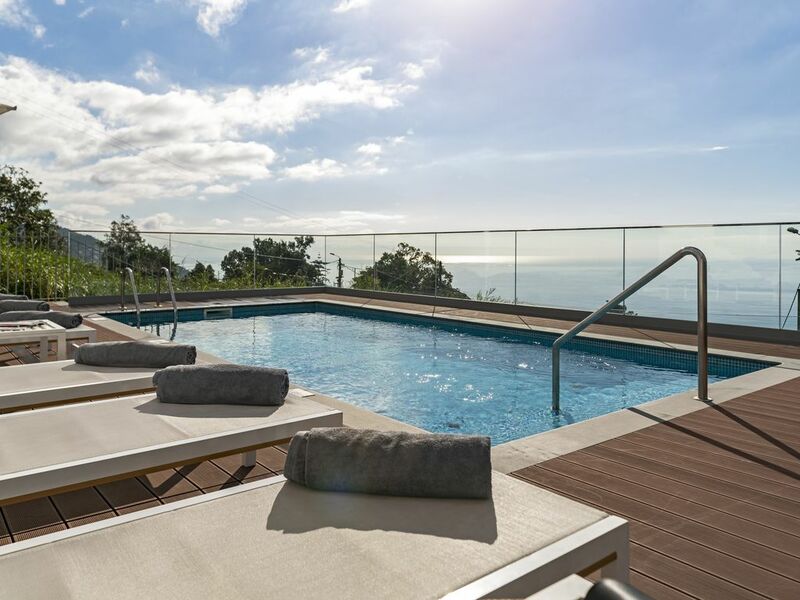 The property description and pictures are accurate, this is a very impressive property, all newly done, very well equipped, spotlessly clean and with splendid views over Funchal and the ocean. We stayed as up couple, so it was a very generous size for the 2 of us. It might be a bit cramped for 6, if the weather isn't good, there is plenty of outside space, but the lounge and kitchen area would be a squeeze. We had quite a lot of rain, so were sadly forced indoors more than we would have liked. We loved the outside terrace, with the pool and BBQ, as well as the roof top seating with chaise longues. It took us about 40 minutes to walk into the centre of Funchal, but it was extremely steep, so we relied on the bus, (convenient bus stop outside) and taxis. On 2 nights, we walked to very pleasant local restaurants, Rustico and Vasca da Gama and also made use of the BBQ on a couple of evenings. The property is well located for getting out of Funchal too, without going through the city centre, very close (we walked) to Monte, with its beautiful gardens and the cable car and with easy access to the mountains and motorway. We would definitely recommend this property. steht dieses Haus in einer Strassenkurve , die sehr befahren ist. Being located between Funchal and Monte, both of these are easily accessible via public transport.